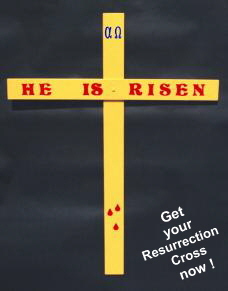 This is the main page of the RESURRECTION CROSS picture gallery. Gallery 1 and Gallery 2 each display thumbnail pictures that you can click to see in a larger size. So, go there to see a bunch of different scenes! We will add more galleries in the future! Please note that photos of the Resurection Cross do not "do it justice" when optimized for the web site. The symbols and lettering are unique and are a major essence of the Resurrection Cross, but once a two-inch letter is reduced to 1/8 inch along with a reduction in resolution, and then optimized for for even smaller file size, a significant amount of color and definition is lost. In many cases, the drawings you see of the Resurrection Cross on this web site are a better rendition of how it actually looks than the photos themselves! The photo here came from a reduced TIFF file that is 800 KB, and further reduced in dimensions and file size to 3 KB. Let's display these crosses everywhere across the USA! When you get yours, take a picture and send it to us for inclusion in our photo gallery! Photos taken on a black background tend to bring out the best color in the cross and also make the smallest file size. The picture at the right was made from the same photo as the little one above. 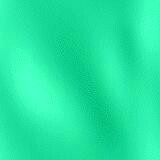 This picture is 6 KB. With a colorful scene in the background, it could easily be 24 KB! If you would like to see a close-up, 128 KB version of this photo at twice the size, then click here. It may take 30 seconds to download; but, to see a large, rather accurate photo of the Resurrection Cross in the least download time -- well, this is it!